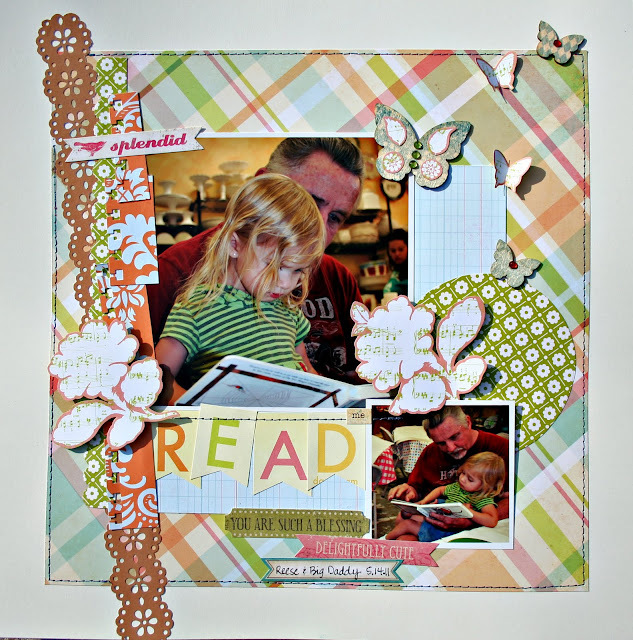 I had a great time creating this layout of little Miss Reese and her Big Daddy (my dad). These pictures were snapped while my mom was working on my Mother's Day gift to her, which was painting pottery with the girl's handprints. While she was painting the base colors on the pottery, Miss Reese asked her Big Daddy to "Read Me" and these are the photos I snapped. Aren't they the sweetest? She just adores him! Supplies from the Scrapbook Circle Garden Party June kit: the girls' paperie "jubilee" Hey Day & Carousel, Pink Paislee Hometown Summer "Summer Fun", Pink Paislee House of 3 Soiree "Music", jillibean soup corn kernels, Studio Calico Wood Veneer Butterflies, My Mind's Eye Stella & Rose "Lovely" Sticker Labels; Not in kit: Imaginisce i-rock and glam rocks; Bazzil cardstock, CTMH Twilight ink, misc. stamps. I mentioned how fun this kit is...I love the wood veneer butterflies. I contemplated keeping them the wood color that they are naturally but they weren't popping on the colors on the paper so I stamped them and added a little decor. I also fussy cut the flowers and butterflies out of the Ho3 paper and popped them on the page. Oh and those "READ" letters were cut from the Pink Paislee Summer Fun paper and I cut them into banners to give them a little bit more kick. I hope you like this layout as much as I loved playing with the kit. Make sure to play along this week with this layout sketch below for your chance to win a June kit from The Sampler. The Sketchy Thursdays layout sketch that they did for Scrapbook Circle recently was so successful that we're doing another one. This time, it's a card sketch. Here's my card, which is already en route to someone VERY special who deserves a little pepping up. Supplies from the Scrapbook Circle Garden Party June kit: the girls' paperie "jubilee" Hey Day & Carousel, Pink Paislee House of 3 Soiree "Music", jillibean soup corn kernels, jillibean soup gruyere cheese; Not in kit: silver speckled felt, Imaginisce "Clouds" Snag 'em stamps (Happy Camper collection); CTMH Twilight ink; Spellbinders Nestabilities Labels Four Small; misc. ribbon. 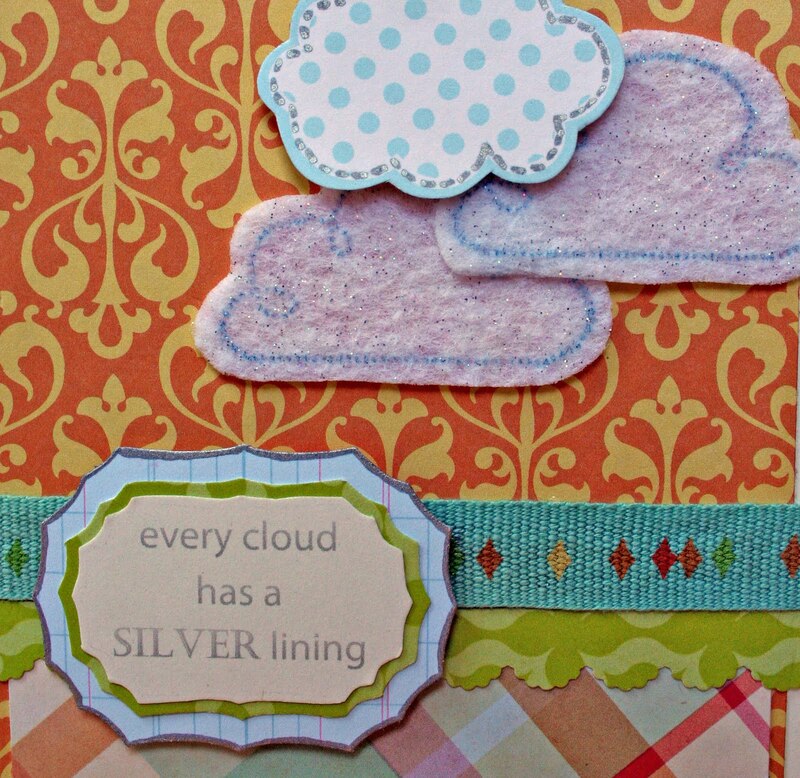 I lined the sentiment with silver metallic ink and then I doodled on the paper cloud with the same silver metallic market. Can you see the specks of silver in the felt? 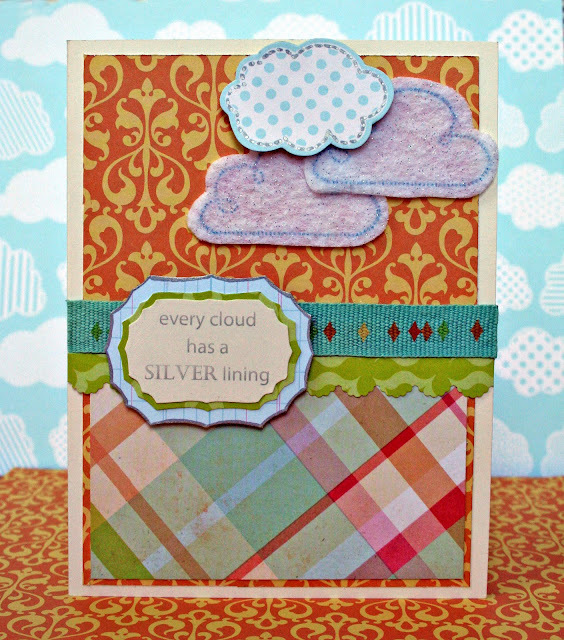 I love the silver lining touch it gives to the clouds. Here is the great sketch I based my card on. 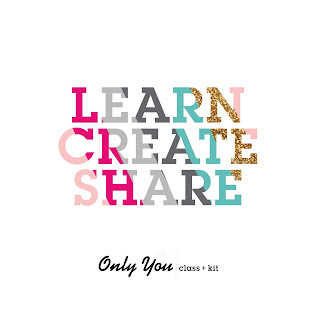 We hope you’ll join us and play along in this challenge over at Scrapbook Circle! 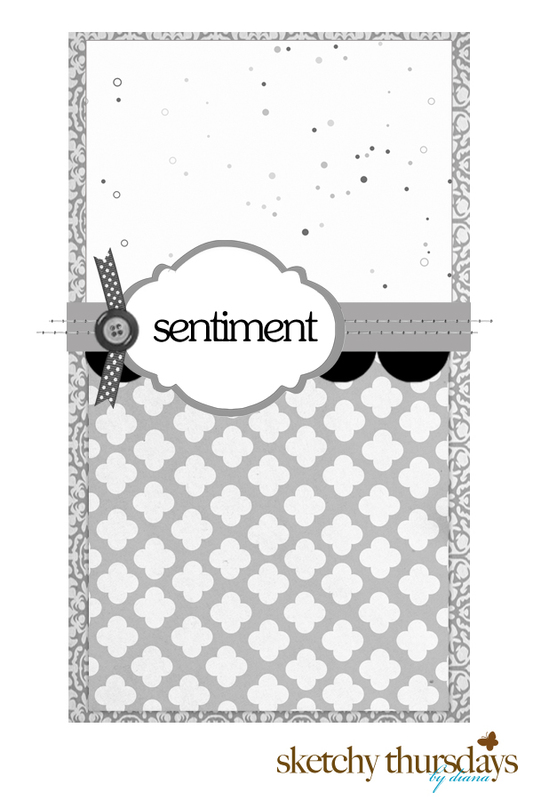 Create a card based on the sketch, then post a photo of your creation on your blog, a gallery, or on our Facebook page. 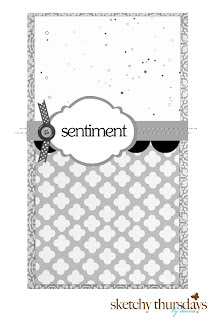 Leave a link to your card in the comments on the Scrapbook Circle Challenge #9 Card Sketch blog post by Wednesday evening, June 15th for a chance to win a Crate Paper "Neighborhood" collection kit. Heather, this is so sweet! Yep, grandparents are the best, aren't they? I am so happy your dd has this bond with "Big Daddy." Oh love your lay out and your card, just adorable. oh, these creations are GORGEOUS. I do have to agree that those butterflies are super fun!